John Deere’s new 959J feller buncher is earning its keep at two logging operations in British Columbia, on the Coast and in the Interior. Prescribed burns show that mountain pine beetle-infected wood heightens the unpredictable nature of forest fire fighting, and that the wood has a dramatically higher fire spread rate. Deere’s new 959J buncher earned its spurs in BC this past winter, working on steep slopes on the Coast and in the southern Interior, and powering easily through six feet of snow. 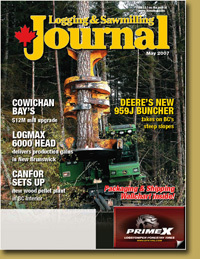 With a $12 million upgrade completed, Western Forest Products’ Cowichan Bay sawmill will be seeing increases in both value and recovery from its coastal wood diet. BC’s Triumph Timber uses an ecosystembased management system to find ways to balance social and economic values with its harvesting plans. New Brunswick contractor Greg Shaddick’s move from a LogMax 5000 head to a LogMax 6000 headthe first of its kind to work in North Americahas resulted in some solid production gains. Contractor Dan Lavoie employs a number of tools to harvest effectively in the bush, one of them being the first tracked harvester in Quebec equipped with the Ponsse Opti 4G computer system. Using innovation and creative partnerships on the residual wood side, Canfor’s Houston region has set up a new pellet manufacturing plant. Great weather, new digs and a variety of new equipment greeted attendees at the recent northern alberta Forestry Show in Grande Prairie. George Fullerton says Canada’s model forests could be very helpful in developing action plans to reduce the impact of the mountain pine beetle.